Allegro Medical presents the Pillow Paws Bariatric Slipper Socks. Pillow Paws Bariatric Double-Imprint Terries Slipper Socks provide warmth, comfort and are an excellent choice for patients that are returning to their feet. Our double-imprint line of patient safety footwear, assures that the slip-resistant tread are always in contact with the walking surface. This assurance helps get patients back on their feet with confidence. Unlike other manufacturers, the slip-resistant tread is printed on the smooth side of the terrycloth fabric. This allows the ink to “puff” and create a full, robust tread design. The ink is not lost in the terry loops, enhancing safety and comfort. 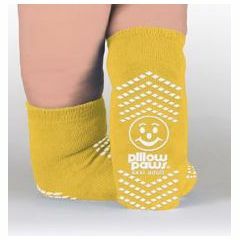 Our Pillow Paws Bariatric double-Imprint Terries Slipper Socks are machine washable for multiple usages. hard to fit sizes. grippers on bottom. inexpensive. could have more tightness. seem to slide off feet. Bought for my husband . has short wide feet. I would highly recommend . Bought for my husband . He is a heavy man . Not very sure on his feet. These are perfect for him. These are very nice a thick. They really grip and there is no sliding around the floors when you wear these. They also wash real nice. They are nice and big for larger people and do not bind up on your legs. I would highly recommend them. I had a hard time to find very large sizes, but found them here at Allegro Medical and very glad I did. Thank you Allegro Medical. I have EXTREMELY swollen feet, ankles & legs from lymphedema . I haven't been able to find slippers or socks to fit. Are these really large?